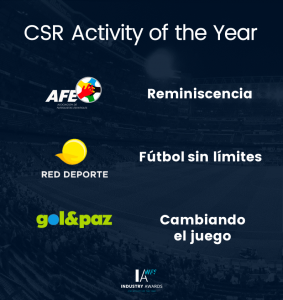 The football industry chooses its best representatives of the year in the categories of Executive of the Year, Venue of the Year, Best Marketing Initiative, Best Football Industry Supplier and CSR Activity of the Year. This year, for the first time, World Football Summit, Spain’s international congress on the football industry will host the WFS Industry Awards that reward the daily work done by football industry professionals that make this sport a real economic engine. With this project, WFS continues to consolidate as a platform for the football industry with this pioneering initiative at an international level which counts with a jury of first level professionals. 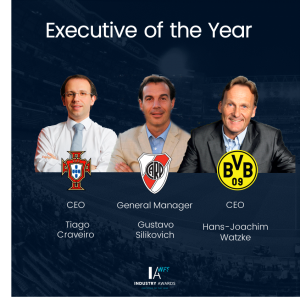 Among the Executive of the Year nominees we find profiles such as Hans-Joaquim Watzke, CEO of Borussia Dortmund; Gustavo Silikovich, General Manager of Club Atlético River Plate; and Tiago Craveiro, CEO of the Portuguese Football Federation. 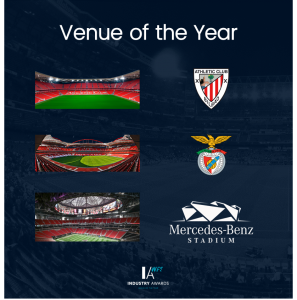 The three candidates Industry Awards finalists for the Venue of the Year are the Mercedes-Benz Stadium, a modern multi-sport space that hosts the Atlanta Falcons from the NFL and Atlanta United F.C. of the MLS; the new San Mamés, premiered by the fans of Athletic Bilbao in 2013, and the emblematic Estadio da Luz of SL Benfica. 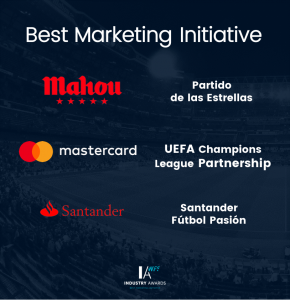 The ambition of their projects and their commitment to football as an ally to improve their brand image have led Banco Santander and their campaign “Santander Fútbol Pasión“; Mastercard and their UEFA Champions League sponsorship; and Mahou, and its campaign “Partido de las Estrellas”, to make it to the Industry Awards finalists for Best Marketing Initiative. 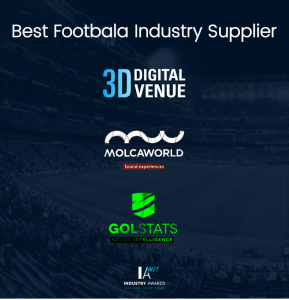 The Industry Awards finalists for Best Football Industry Supplier are 3D Digital Venue, 3D interactive solutions in 360º for stadiums; GolStats, specialized in the analysis of the game using VR; and MolcaWorld, branding experts and architects of the brand new image at Balaídos and the Ramón Sánchez Pizjuán stadiums. One of the essential components in any sport is its social vocation. World Football Summit has highlighted the work of several organizations with its CSR Activity of the Year: Gol & Paz – Cambiando el Juego, and its ability to bring together organizations, companies and government entities with initiatives that promote peace using football as their main tool; AFE – Reminiscencia, the project aimed at bringing back the best memories of the elderly with cognitive impairment; and Red Deporte y Cooperación – Fútbol sin límites: for its idea of using football as a bridge towards a better education, health, integration or job access. The award ceremony will take place at a gala cocktail to be held on the evening of Monday, October 16th, at the Palacio Neptuno in Madrid, which will bring together football club managers, agencies, sponsors, associations, NGOs and institutions who work in the football industry.